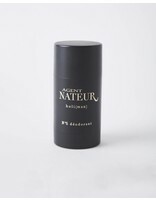 Agent Nateur handmade and organic deodorant. Light notes of votiver, rose, sandalwood, cistus and cedarwood. GMO, pesticide and cruelty-free.